…in poker you can actually win an unreal amount of money if you have the right winning hand. Poker is a ridiculously amazing game. While the government has tried to argue that Poker it’s a game of luck, most agree that it’s skill-based. After all, unlike casino games, in poker you can actually win an unreal amount of money if you have the right winning hand. Think about it. When you play poker, online or off, you can enter the game with the worst hand in the game and come out on top against the absolute best. Just because you’re dealt a 7,2 off-suit, it doesn’t mean you can’t force a guy holding a pair of Queens to jump out of the game. Through the magic of bluffing, you can trick other players into thinking you have a way better hand than you do. Bluffing a player out of a hand is fun, but being on the receiving end of a bluff is not. So how do you know if a player is bluffing at the poker tables? Just follow these simple tips. If you’ve ever been to the WSOP or any other land-based tournament, you’ll notice players getting massages in their seats. Part of it has to do with the fact that sitting down in the same position for 12 hours can be brutal. But the other part has to do with avoiding being caught bluffing. When you’re lying, your shoulders tend to crunch. If you can watch for it carefully in other players, you might be able to catch a bluffer. Players with a really bad hand who are bluffing are going to try and get you out of the hand, especially if you’ve already called a raise. They might counter with an even bigger raise, and if their hand is pretty mediocre they’ll be quick to make the call. It’s all part of a plan to make you think they’ve got a way better hand than they do. Players with great hands will try and become an actor, over-thinking and over-analyzing their play to make you think that they’re scared when they’re really unbeatable. This usually happens on a raise from another player. The bluffing opponent will try and pretend their hand isn’t that good so that you’ll shove even more chips into the pot on the next hand. When the flop comes (and the turn and the river) keep your eyes on the other players. If they’re staring at the board long and hard, they’re probably looking for a card they needed to hit. For example, a player who needs an Ace might stare at that other Ace on the board, hoping it catches. If you can figure out where their laser-focus is zoned in on, you might be able to figure out what they’re wishing for. 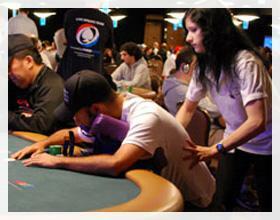 Many poker players employ betting patterns, unknowingly, when calling or raising. They might raise 10X the big blind when they want you to fold or they might make it 3X the blind when they want you to stay in. It takes a bit of time to learning betting patterns, and it might cost you a few chips in the process. But it’s well worth it. Love poker? Try video poker at Palace of Chance. Unlike online poker sites where you play against other players, you don’t have to worry about bluffing. In many versions of video poker, you can win with a pair of Jacks, so check it out.